If you can mix a drink with the best of them, this might be a good second job for you. Not only can you receive an hourly wage, but you get tips as well. 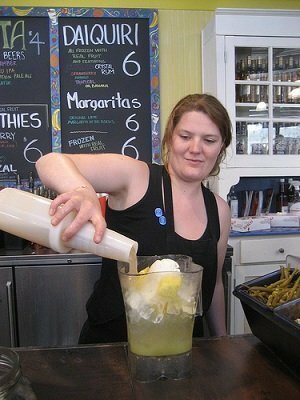 Many bartender jobs are flexible, allowing you to work evenings and weekends. You can keep your day job and earn money in the evenings. Like bartending, waiting tables is a job that is relatively flexible. You can work in the evenings or during weekends. If customers like you, you can make a lot more in tips. One of the things I liked about being a waitress was that I always had cash in my pocket at the end of a shift. Many medical professionals make audio notes and transcribers turn them into reports that can be read. A a medical transcriptionist, you have to be accurate, and have knowledge of medical jargon. With some training, though, you can become proficient. Because medical transcription is something that happens after the fact, it’s possible to find offices and labs that will allow you to come in outside normal office hours. You might even be able to do some of the work from home. There are some parents that need to work overnight shifts, or that have other reasons to have their children watched at odd hours. You can provide overnight day care services, filling a need. Of course, if the kids are up, you won’t get much sleep. But, once many kids get used to the routine, they’ll sleep through the night. You can offer your services with a landscaping company. Much of the time, it’s possible to work weekends with this type of work. You might also be able to work weekends. Find out if the crew you are working with has flexible hours. In many cases, they are happy to let you work odd hours so they don’t have to. There are many temp agencies willing to work around your hours. In fact, you might be filling a special need if you can work nights and weekends. Let the temp agency know of your availability, and there is a good chance that you will find the hours. Plus, with a temp agency, you can turn down a job if something else comes up during that week. Many cities hire bus drivers for certain routes and times. Recently, I saw an ad in my local paper advertising a vacancy for a weekend bus driver. This state affairs might also be true of train operators and others working with public transportation. After going through the training process, you will be assigned your route, and you can start earning extra money on the weekend or during the evening. Many business people make use of virtual assistants. Thanks to technology and the rise of the digital workplace, it’s possible for you to assist people who might not even live in your state. You perform administrative tasks like reading emails, arranging travel, making appointments, creating memos, and doing other tasks. In many cases, it’s possible to work in early mornings and evenings, as well as on the weekend, arranging your workload around your “regular” job. You can do freelance work on the side to earn extra money. Writing, graphic design, web design, and software development are some of the jobs that you can do on a freelance basis. As long as you have the requisite skills, it’s possible for you to do this work — and do it when it’s convenient for you. Depending on the store, it’s possible to work retail as a second job. For years, my brother worked as a night stocker for a retail chain from 8 pm to 12 am. It was a way for him to make money, and it allowed him to do other things during the day. There are many retailers happy to work around your schedule — especially if you are willing to work nights and weekends. What’s your best second job idea?